Unilaterally respected around his Crescent City birthplace as both a performer and a songwriter, guitarist Earl King was a leading New Orleans R&B force for more than four decades. Born Earl Johnson, the youngster considered the catalogues of Texas guitarists T-Bone Walker and Gatemouth Brown almost as fascinating as the live performances of local luminaries Smiley Lewis and Tuts Washington. King met his major influence and mentor, Guitar Slim, at the Club Tiajuana, one of King's favorite haunts (along with the Dew Drop, of course). The two instantly became friends. 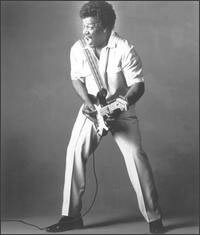 Still performing under the name Earl Johnson, the guitarist debuted on wax in 1953 on Savoy with "Have You Gone Crazy." On this record, longtime pal Huey "Piano" Smith made the first of his many memorable supporting appearances. Johnson became Earl King upon signing with Specialty the next year. Label head Art Rupe intended to name him King Earl, but the typesetter accidentally reversed the names. "A Mother's Love," King’s first Specialty offering, was an especially accurate Guitar Slim homage produced by Johnny Vincent, who would soon launch his own label, Ace Records, with King one of his principal artists. King's first Ace single, the seminal two-chord south Louisiana blues "Those Lonely, Lonely Nights," proved a national R&B hit (despite a sound-alike cover by Johnny "Guitar" Watson). Smith's rolling piano undoubtedly helped make the track a hit. King remained with Ace throughout the rest of the decade, recording an unbroken string of great New Orleans R&B sides with the unparalleled house band at Cosimo's studio. He later moved to Imperial to work with producer Dave Bartholomew in 1960, cutting the classic "Come On" (also known as "Let The Good Times Roll") and 1961's humorous "Trick Bag." He managed a second chart item in 1962 with "Always a First Time." King wrote standout tunes for Fats Domino, Professor Longhair, and Lee Dorsey during the 1960s. Although a potential 1963 pact with Motown was scuttled at the last moment, King admirably rode out the rough spots during the late '60s and '70s. In the 1990s, he rejuvenated his career by signing with Black Top; Sexual Telepathy and Hard River to Cross were both superlative albums. He died in April 2003 due to complications from diabetes.